Posted by DustinRJay in rental yields, valuation models. In the previous post, I discussed how Calgary rental yields are less than many safe investments like bonds. I was interested in how the price to rent ratio compared in a historical perspective and what were the valuations like compared to previous real estate cycles. A price to rent ratio is similar to the price to earnings concept which is borrowed from the equity markets. The idea is that house prices can be compared against the cash flow that can be generated from the property. Ergo, the higher the house price in comparison to the rent, the poorer the value of the asset. RBC published a report in 2005 called “House Valuations Across Major Cities.” At the time of the report, it stated that price to earnings ratios for Calgary real estate had pushed “significantly beyond” late 1980’s levels. 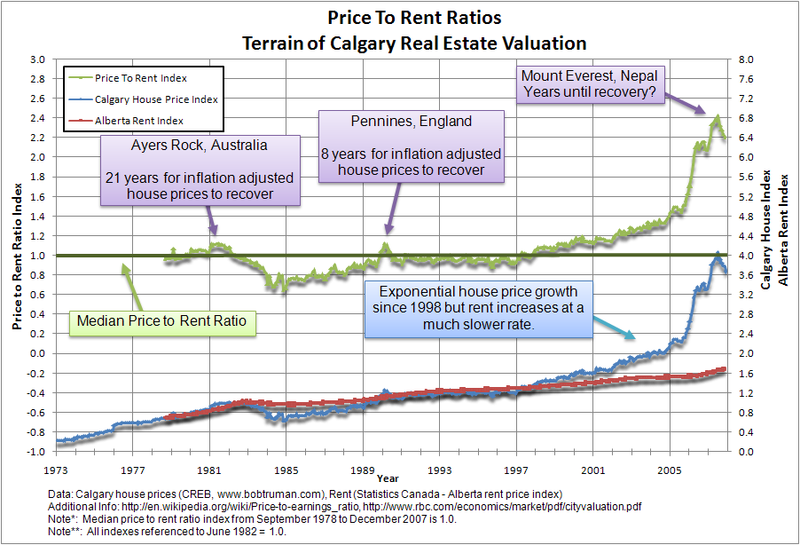 The following is a graph of how price to rent ratios compare in Calgary. As you can see, rental yields are an underlying fundamental of house prices up until 1998, when house prices started increasing exponentially, but the trend for the rent index stayed at roughly the same as inflation. The current valuations are roughly double the long term price to rent ratio. This information dovetails with my previous blog entry wherein I came up with a rental yield of 3.1% for Calgary house prices which is less than safe investments like bonds. A comparison against the long run price to rent ratio and the current valuations indicates that a more rational valuation would be 6.2% (slightly above low risk assets like bonds). Therefore, caution may be warranted if buying, as house prices are roughly double traditional valuations. Radley it may be interesting if you overlayed an inflation adjusted WTI price and AECO spot price to this. Im guessing you will see a nice correlation that lags just a wee bit behind. Good work radley. I like the analytical approach with real numbers and a historical perspective. I have put a link up from my blog. Savard Real Estate provide services Calgary office space, Office space for rent Calgary & Calgary office leasing in Galapagos, Canada,Kenya, Manila, Morocco, Italy, Hongkong, Cambodia, Thailand, etc. And also we have 15 years proven track record of satisfied clients. when it comes to determining future home values. When estimating future market income growth, both current job growth within the local market and an approximation of the overall growth of the Canadian economy are considered. Really a very nice post! It’s something I have never thought about, really, but it makes a whole lot of sense. Thanks for sharing the valuable information regarding Real Estate Valuation.